Hope you enjoy my thoughts on these 7 pitching command killers. There are certainly lots of opinions and theories on this matter, however I have formed a collective amount of empirical data and evidence, as well as trial and error over the course of many years to reach conclusions on these specific command killers. 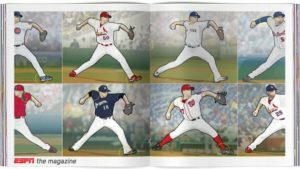 These command killers present a unique perspective to things that may be altering a pitchers command that aren’t talking about mechanics. Many pitchers get caught up in “pitching with intent” rather than the intent to execute a pitch to a specific location. Lets be perfectly clear, if your specific training method doesn’t involve accountability on consistently executing pitches to consistent locations, your command will scuffle. The ultimate goal is to execute your location at a high rate, at max output. There is a process to achieving that. That process does not fall into place operating at 100% in search for true command. The process leads to that. roboticism is another. There is a point in time where pitchers must focus on the ability to shape the mold of their motion as they see fit, hopefully an optimal one. Regardless, once that point is semi-reached, its vital to let the body move freely, loosely, and repetitively in order to achieve natural consistency. So often I find pitchers obsessing over movements to the point where they have no chance to work on touch and feel of release points and execution. At some point you need to trust your motion, your mold, and let it fly. Your pitching motion is built to execute pitches, and that requires more of your focus than diverting thoughts to mechanics. During my time as a Division I pitching coach I was able to implement a levels system that allowed the staff to take weekly pressure tests in order to advance in command levels. There were 12 total levels and every week pitchers had a chance to practice for their current level and test at the end of the week. PRESSURE greatly affects ability to command, which explains why 1/3 of the staff would crush the level to be tested all week long, and fail the test on testing day. Their ability to pass or fail levels were reflective of their ability to command and execute in game situations. The pitchers who made it to level 12 were the aces of our staff, and performed at a higher level than others. If you want to command in actual baseball games, your practice and ability to execute in practice must outweigh any environment you enter into on the pitchers mound in a game setting. Umpires aren’t the reason you are walking the bases loaded. 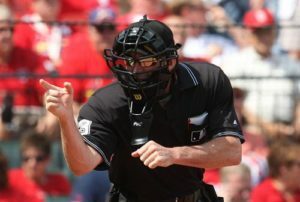 The reason umpires are listed as a command killer, is because its not the umpire that is killing command, its the pitchers perspective of the umpire that’s killing command. Clean up your mentality! He has a small zone! He isn’t giving me my calls! Definitely a home team umpire! These pitches are so close! The other pitcher gets that call! This guy has it out for me! Some pitchers are quick to react to calls of an umpire early on if they don’t get a call, or miss a close one early in their outing. Again, its not the umpire, it not even necessarily the pitch, its HOW YOU RESPOND to calls, and HOW YOU RESPOND in following through with your strategy. If your strategy is the have the catcher setup down the middle and blow gas by everyone than that’s fine, but if you fall behind in the count 2-0 don’t expect the pitches nipping the corners and edges of the zone to be called strikes for ball 3 and 4. If you want better calls be more consistent, keep your radius small. Umpires desire consistency, you may be surprised how much respect you may earn from the umpire if you are able to display actual command, and more importantly respect with your “misses”. Listen if you want to be a pitcher, hitting guys is part of the game. You are going to have guys standing in all parts of the batters box. I’ve witnessed some great pitchers completely lose their ability to command based on some hitters crowding the plate. If an object is affecting your ability to focus on executing your location, you need stronger focus and trust in your ability. Looking back on my career, I could always sense if hitters were up on the dish, but it was almost as if they were a blur in peripheral vision when looking in for sign and on approach to home plate. Know where they are, use it to your advantage. Learn. The batter’s position in the box didn’t ruin your command, you did by letting it affect you. Prepare yourself better. If you hit them, so be it. Execute better. They are giving you a free tip on how to get them out. The majority of the killers so far are items that affect pitchers mentality, not necessarily the item in and of itself. In this particular case, the catcher can absolutely be a command killer. There is only so much you can do from the pitching side of it, as coaching your catcher how to have a superior receiving stance, soft and easy hands, and overall quality catching IQ isn’t something any one person may have the knowledge to do, let alone the audacity to coach up their own catcher. 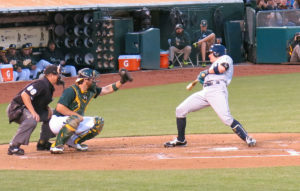 The best thing you can do if you are working on truly commanding your pitches is communicating as much as you can with your catcher as to where you need him to setup and that he gives you a target in the specific areas you need them, as well as moving his entire frame. Catchers who have poor representation / framing skills can make it harder to establish the zone. Be polite about nudging them to some catching instruction. A poor receiver can account for ample pitches in discretionary zones to be called balls and even turning definitive strikes to balls. So you are making great strides with developing your velocity. That’s great and I’m sincerely happy you succeeded in that goal, as velocity gains take a significant amount of hard work. How will the added velocity be relevant to success in a baseball game if you aren’t in command of it? How can you strategize against a lineup that LOVE hitting fastballs and like to sit dead red. The inability to move the ball around the zone will soon negate your added velo. It’s unfortunate, but for the MAJORITY, its the truth. If you want to pitch at a high level sporting command, it is a -day in, day out- process. You live, eat, breathe command. Understanding it as the primary element of getting a hitter out, let alone making him put the ball in play to make the game go, is vital. If you want to throw hard and continually work on gains that’s fine, but hold yourself accountable with WHERE you are throwing the baseball, and hone your ability to execute locations at a high rate. If you don’t trust that command and location (effects of Effective Velocity) will be the strongest influence in the consistency of how you get hitters out, you won’t live it. Understand it and Live it, or don’t command.